This week: This time, I think about how a computer game can educate players in a foreign language. I briefly discussed the idea of using computer games for the purpose of language learning in Finding of the week #118 . In this article, I like to present a computer game that demonstrates an ideal way to teach a foreign language to computer game players. 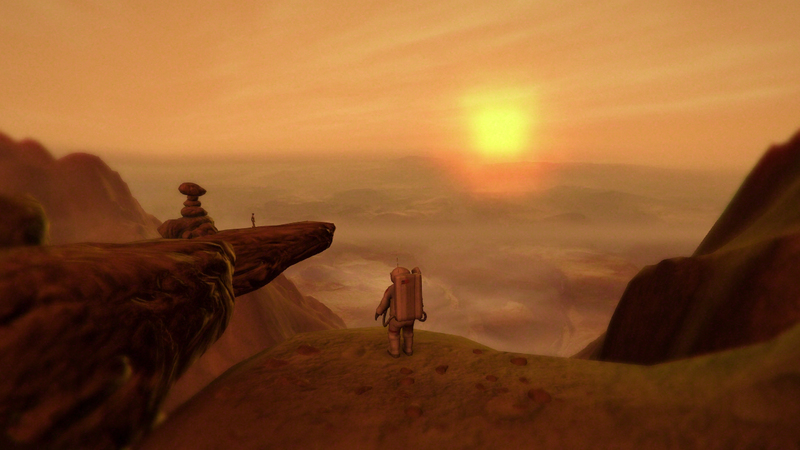 The computer game Lifeless Planet  puts the player into the role of an astronaut who is stranded on an unknown planet. After a long journey through the vastness of space, the astronaut and his other crew members had a crash landing on the planet which they wanted to explore. After the astronaut regained consciousness, he is sitting alone in the capsule and as he leaves the spacecraft, he finds human footprints leading away from it. In contrast to all the observations made by scientists, the planet is not a lively world. Instead, it is a complete desert and the atmosphere has not enough oxygen to keep the astronaut alive without his space suit. A couple of minutes later, the astronaut discovers a leak in his space suit–the fight for survival has begun. During the story of game, the astronaut encounters a mysterious woman and starts to follow her as she seems to know how to survive on this hostile planet. Although the astronaut tries everything to speak to her, she always runs away and does not allow him to approach her. The chase continues until the astronaut has to traverse a very dangerous area. Just in the moment as he enters the area, the woman stops him from running into his doom and helps the player to move through this area by giving additional advice. Aside from giving hand signals, she also shouts commands in order to guide the player through the dangerous area. However, these commands are not in the language the player has selected for the game as the woman only speaks Russian. As a result of this, the player starts to learn some basic commands like „Stop“ and „Go“ in Russian while he plays the game. This special game mechanic of guiding the player using a foreign language presents an ideal way of introducing learners to a new language. The immersive effect of the game gives those commands a special meaning and thus increases the player’s motivation to listen and to understand what the woman shouts. Additionally, the woman uses hand gestures in order to provide a common ground that helps the player to understand her words. Furthermore, the woman repeats the commands and, as a result of this, the player has the chance to memorize these phrases due to repition. This game mechanic can easily be enhanced and reused in different contexts in order to expand the language proficiency of the learners. Moreover, the amount of spoken words can be increased over time and thus help the learners to understand the grammar of the language. Additionally, the learning effect can also be enhanced by providing subtitles in order to present the spoken and written word at the exact same time. In the end, computer games could be an ideal environment for the purpose of language training as they can present the language in a vivid and engaging way. This week: This time, I think about the positive feedback I received from professionals about my field of research. Last week, I wrote about the experiences I made during a language proficiency test . The test began with some general questions about my work and my hobbies and so I was able to present my work as a Ph.D student and my field of research to the two examiners. In other words, I presented the general concept of the „gamification of learning“–the application of game mechanics in order to increase the learner’s motivation and engagement to practice the learning content. Moreover, the gamification of learning aims at the utilization of game mechanics that demand a certain skill or human ability in order to realize a direct training effect. Surprisingly, one of the two examiners, who is a professional language trainer, asked right away, if I would think that this concept would also work in the field of language learning. Of course, the gamification of learning could also be used in order to learn and practice a foreign language. For instance, the learners could play an adventure game and while they are progressing through the story, the game will present and demand more and more elements of the language to be learned. This could be even enhanced with the implementation of a voice recognition system in order to allow the learners to actually speak the language. After I had completed the first part of the test and was waiting for the beginning of the second part, the other examiner approached me and agreed that the whole gamification concept would work very well in his field of work: the training of pilots. Aside from practicing in a simulator, pilots need to learn a lot of additional knowledge in order to achieve a type rating for a certain airplane. A type rating is a certification that enables a pilot to fly a certain aircraft. During this conversation, he basically described the application of the most used game element for the purpose of increasing the motivation: the reward mechanism of computer games. Pilots could get rewarded when they achieve a certain amount of knowledge about the airplane they are training for. Subsequently, this would result in a higher motivation to continue learning. On the one hand, I was more than happy as I spoke with my examiner about this idea as it made me realize how important and useful my work is. On the other hand, this discussion also revealed the fact that the understanding of gamification is mostly linked with the application of these reward mechanisms. They are very simple to implement and thus are already used everywhere. Receiving virtual badges or other virtual goods is often used to raise the engagement of users to use a certain system. Although it was great to discuss the possible applications of the findings in my field of research, it also made me realize that I still have a lot of work to do in order to demonstrate the power of the gamification of learning as it can realize so much more. There are plenty of game mechanics that demand so many different skills and human abilities. As soon as these demands are identified, the game mechanics can be used in training environments in order to demand the right set of skills that is needed in a certain profession. By doing so, the knowledge gained during the utilization of the virtual training environment can directly be transferred to the real world application as both situations share similar demands. Nevertheless, it was really refreshing to discuss the own work with professionals who are directly involved in a training process and who independently saw the benefits of my work for their fields of work. This week: This time, I think about my experience of passing a language proficiency test. Language proficiency tests are complex as they are intended to assess a candidate’s linguistic capability. For this purpose, a language proficiency test has to evaluate different linguistic aspects, such as pronounciation, structure, vocabulary, fluency, comprehension and interaction. Recently, I passed such a language proficiency test and was a little bit surprised about its structure as the time allocated for the different aspects seemed relatively short. The test consisted of two main elements: a speaking and a listening and comprehension part. During the speaking test, I was required to give a short presentation about an unknown topic and to comment on three different statements. Surprisingly, the expected duration of the presentation was only two to two and a half minutes and so relatively short. However, being able to fluently speak for two and a half minutes can already provide a good indication about the candidate’s ability to express himself in a foreign language as this time is long enough to present a lot of information and to assess the candidate’s language prophiciency. Additionally, increasing the time could result in the problem that the candidate runs out of content and thus is no longer able to keep up the flow of the presentation. This part resulted in a test of the pronounciation, structure, vocabulary and fluency as these linguistic aspect are mostly required during a presentation. After having completed my presentation, I was confronted with three different statements and had to express my own opinion. Furthermore, the examiners asked some follow-up questions in order to simulate a conversation. This part was intented to assess the candidate’s ability to comprehend and to interact. Finally, I had to complete the listening and comprehension part which consisted of a multiple-choice test about fifteen different audio files. The multiple-choice test provided one question per audio file and was designed to assess the candidate’s ability to comprehend the content of each audio file. The difficulty of this part was enhanced by the fact that the audio files included different English accents. Although the whole test seemed to be relatively short, it demanded and tested all of the linguistic aspects. This week: This time, I think about the results of my short experiment of explaining a complex task while driving a virtual race car. A long time ago, I presented a concept of utilizing Assetto Corsa (AC)  to demonstrate the danger of using a cellphone while driving . The experiment consists of three stages and allows players to experience the impact of talking while driving. At first, the players must get a feel for the driving experience in AC and learn how to drive the virtual race car. After having practiced driving in AC, the players are required to drive for a certain amount of time on a particular racetrack with the goal to constantly improve their lap times. During this stage, the players are not subjected to any distraction and can fully focus on the task of driving as fast as possible. Finally, after the players have completed the second stage, they are required to drive again for the same amount of time on the exact same racetrack. This time, however, they are required to explain a complex topic and to record their explanations using a microphone while they are operating the virtual race car. In the end, after both stages are completed, the players can compare the lap times between these two sessions and also listen to their explanations in order to experience the impact of talking on their driving performance. Recently, I managed to give this experiment a try and to record the results of it. Naturally, the results are not statistically relevant as I kept this experiment relatively short by driving only two laps per stage. Additionally, I skipped the learning phase as I was already used to drive a race car in AC and, as a result of this, the experiment was reduced to a two-stage experiment. 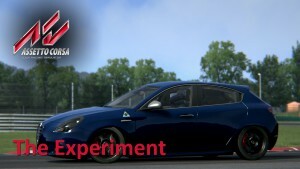 For the purpose of measuring the influence of talking while driving, I drove the Alfa Romeo Giulietta Q.V. on the Magione racetrack. After having completed the outlap, I drove for two consecutive laps without talking and thus I was able to fully focus on driving the car. Subsequently, I completed two additional consecutive laps with the task of explaining a complex topic  while driving. Despite the limitations of the experiment, the results are a good indication for the negative impact of talking on our driving performance. During the first stage, I achieved lap times of 1:35:617 and 1:35:249, respectively. During the second stage, I achieved lap times of 1:37:393 and 1:40:988, respectively. The main reason for these slower lap times was the fact that I frequently missed the exact braking point and thus had difficulties in driving through the turns of the racetrack. Furthermore, my ability to explain a complex topic was negatively influenced as well. While driving through more demanding parts of the racetrack, I occasionally lost track or I had to stop talking in order to recover the car. The slower lap times and the difficulties in explaining a complex topic are good indications for the negative impact of talking while driving. Moreover, I was only challenged by the task of explaining a topic. Using a cellphone while driving also requires the driver to follow and to understand the conservation and, as a result of this, using a cellphone could have even a higher impact on the driving performance. Furthermore, I was completely alone on the racetrack and had not to monitor the traffic around me. As a conclusion, doing other things while operating a vehicle is very dangerous as even a short lack of focus can have devastating results.